The mezzo-soprano operatic repertoire, after it has moved on from Gluck and Mozart to Rossini and Donizetti (of whom Vesselina Kasarova has already given us some notable recorded material), reaches a parting of the ways. Those with a "big" voice with plenty of "heft" proceed to such Verdian roles as Azucena and Amneris. Classic operatic mezzo-sopranos of this type were Fedora Barbieri and Giulietta Simionato, and while reviewing a recent recital by Marina Domashenko (DELOS DE 3285) I suggested that she might fulfil a similar role for our times. A mezzo-soprano with a lighter timbre, on the other hand, will take the path of French opera, leading through Gounod and Bizet to Saint-Saëns and Massenet. This has so far been the case with Kasarova � she has also proved an excellent lieder singer, though such is the ringing authority of her high notes that I suspect she may take in the Verdi roles later. However, what we have here is a selection of French arias (yes, I know Meyerbeer was German, but the Paris Opéra was his home) which is both enterprising and un-hackneyed (though some, such as the Sapho and Mignon arias were standard repertoire until the mid-20th century). Note that the aria from Samson et Dalila is not the most famous one. Since that aria is the one piece in common with the Domashenko disc I should like to start here, and I have to say at once that while Domashenko makes a gorgeous sound and her singing as such is as good as Kasarova�s, Kasarova easily surpasses her in communicativity. Saint-Saëns has posed the interpreter a problem similar to that of Richard Strauss�s Salome; the singer has to express some pretty ghastly thoughts while singing sumptuously beautiful music. Domashenko, frankly, might be singing about anything. Kasarova, on the other hand, is suitably sinister in the recitative and when she sings of pouring "the poison in his breast", how she gloats over her wicked thoughts. I have before me notes scribbled down after each aria, but I wonder if it is useful to reproduce them all when the message is that, quite simply, Kasarova reveals the essence of each piece she has chosen. The opening item from Les Huguenots strikes by both its agility and its characterisation, the Berlioz opens most dramatically but then, in the lament itself, she proves fully aware of the Gluckian dignity of the music. In the Sapho aria, a particularly beautiful piece, I noted how, at the end, she opens up thrillingly at "Ouvre-toi", and then engages her darker colouring as the voice descends. And so I could go on. I just have no negative points at all. 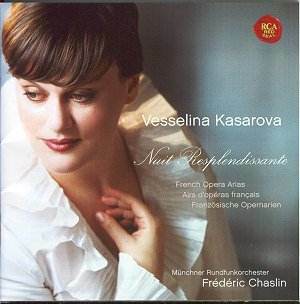 When reviewing Kasarova�s La Favorite I did question whether she was really a mezzo-soprano since her upper register is so pingingly clear and her lower notes make considerable use of the chest voice. This disc makes things much clearer. Certainly, she gives clear evidence that being a mezzo can be a matter of choice since anyone who can manage such an effortless high C as she does in the Roméo aria could have trained as a soprano if she had wished. On the other hand, her lieder CD showed that she can descend quite low without a trace of the chest voice if operatic weight is not required. However, in choosing to be a mezzo she has chosen to give us the full benefit of her glorious middle range, while her upper notes are not the less thrilling for the fact that they are not so frequent, and her descents below middle C are similarly affecting. She has, I would say, a true sense of where her vocal strengths lie; allied to innate musicality and the artistry of a real interpreter, she is surely set to be one of the major artists of our times. Frédéric Chaslin is a new name to me; he proves an excellent partner. The recording is excellent. André Tubeuf�s notes have more waffle than substance but we get the texts with translations into English and German.